It may be 2013 but Microsoft is fully rooted in 2012 today ... Windows Server 2012 R2, that is. But along with details of its server OS, Microsoft had a mountain of other news for its enterprise and business customers. First up, Microsoft revealed it plans to release Windows Server 2012 R2 along with System Center 2012 R2 on Oct. 18. 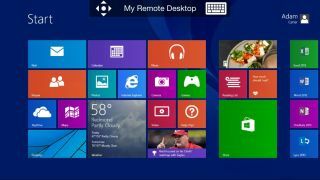 As we noted in our "What's in Windows Server 2012 R2 for small businesses" report, Remote Desktop apps for iOS, Android and Mac OS X will be available in appropriate stores by the end of the month. Together, the two R2s aim to "create datacenters without boundaries" with high-scale visualization, high-performance storage at a low cost, software-defined networking that's built in and hybrid business continuity. Microsoft will also deliver the next version of Windows Intune on Oct. 18, allowing mobile users to access apps and data whether they are using Windows, iOS or Android. Wrapping up next Wednesday's releases (which on the non-server side includes Windows 8.1) are Visual Studio 2013 and the new .NET 4.5.1. It's all about hybrid cloud performance with Microsoft's new enterprise products, the company noted in a press release, one that lets team members build out and deliver better applications faster. Looking ahead to next month, Microsoft will offer Enterprise Agreement customers exclusive access to discounted Windows Azure pricing on Nov. 1. No need to worry about upfront commitment, overuse penalties or rigid payment plans - Microsoft plans to make it as carefree as possible to get into the cloud. Keeping with the barrier-breaking theme, Microsoft also announced it has entered into a strategic partnership with Equinix, the self-proclaimed largest IBX data center and colocation provider. Customers, Microsoft wrote, will be able to connect their networking using Azure at Equinix exchange locales. Before the new Azure prices become available, there are few more releases due this month. Next week will see the second preview of SQL Server 2014, dressed to the teeth with in-memory technologies offered at no extra charge. Microsoft claimed the new version gives customers 10 to 30 times performance improvements with no additional app rewrites or new hardware needed. Near the end of the month, Microsoft will release Windows Azure HDInsight Server, described as an Apache Hadoop-based service that works with SQL Server as well as business intelligence tools like Excel and Power BI for Office 365. Finally, later this month Microsoft will make available the next major version of its CRM solution, Dynamics CRM Online Fall '13. Offering more contextual information than its predecessor, CRM Online's on-premises flavor is expected to hit the virtual shelves later on this fall. Thinking about a Surface Pro 2 for your business? Check out our review to see if it's right for you.